Hey comic book fans! Did you know that this film inspired Scottish writer, Grant Morrison, to create the 'Batman Incorporated' ongoing series? God only knows why though. Maybe it had something to do with the Director: Joseph McGrath; and Actors; Peter Sellers, Spike Milligan, Monty Python, The Beatles, Richard Attenborough, Raquel Welch, and some of the Carry On crew too. But only for 92-minutes in 1969 of course. Eccentric Multi-Millionaire, Sir Guy Grand (Peter Sellers), plus his newly purchased son, Youngman Grand (Ringo Starr), both head off into the wild unknown together, and... and... and? Errr? I'm not really sure to be honest with you! Now I'm nigh on positive that it doesn't have anything to do with Guy sacking his employees and then dumping them in parts unknown. Moreover, I am fairly sure that it's not associated with hot-dog's, shooting pigeons out of the sky with a tank, a boxing match were two of the competitors kiss each other, or Guy's sisters either. However, I have a pretty good idea that their adventure is all to do with cash. You see, Guy does bribe a traffic warden (Spike Milligan) to eat a ticked that he recently issued him. Then he pays off a director at Sotheby's Auction house (John Cleese) after defacing a painting he purchased. Oh! And I best not forget to mention about how Guy fixes a boat race by bribing one of the teams involved (including Graham Chapman and Richard Attenborough). Hey! Wait a minute! Boat's! That's it! Guys and Youngman's adventure together all comes to a head when they step on board the luxury cruise liner called 'The Magic Christian'. As pomposity goes all floppy - Yul Brynner goes all soppy - Christopher Lee and Raquel Welch both take a bite - and at the end of the day businessmen can't help but swim in sh*te. Now what can I say about 'The Magic Christian' that won't upset anyone who's enamored by any of the actors in this piece? Well, I am such a person you see. A fan. A very big fan who has always loved the works of people such as Peter Sellers, Spike Milligan, the Beatles, Monty Python, and generally any of the stars starring in this movie. Wait a minute. I know what I will do before I get to my summation, let's have some filmic facts first, OK? (1) The film was based on a novel written by Terry Southern, and was one of the main reasons why famed film director, Stanley Kubrick, wanted to collaborate with him on the cold-war satire 'Dr Strangelove' [click here for the review]. (2) 'Youngman' was not in the original 1959 novel. This character was used to re-elaboration of 'Guys' earlier exploits. Also, it was set in America too -- not England. (3) The theme tune for this flick, 'Come And Get It', was written by Paul McCartney, and performed by the Welsh Rock band 'Bandfinger'. (4) Peter Seller's wanted to leave this picture after the first day of filming, because he felt his performance in it was very bad indeed. He was eventually persuaded otherwise though. (5) This was the first time soon to be 'Python', Graham Chapman, performed in front of a film camera. Unfortunately, it was the last time for Alfred Hitchcock stalwart, Isabel Jeans. (6) John Lennon was originally meant to play the role of 'Youngman' in this movie. But when he was arrested on drugs charges, his part then went to his fellow Beatle, Ringo Starr, because he was the only member of the band that got a favorable mention in their film 'A Hard Days Night' [click here for the review]. Plus, on a side note, it wasn't John and Yoko in the final scene either -- for similar reasons. (7) Whilst making this flick, Peter Sellers and Spike Milligan made a personal documentary about Peter called 'Will The Real Peter Sellers Please Stand Up?' [click here for the review]. (8) John Cleese and Graham Chapman wrote an early version of the script -- later they were joined by Terry Southern and Peter Sellers -- in which the only scenes of theirs that remained are those two they were in. 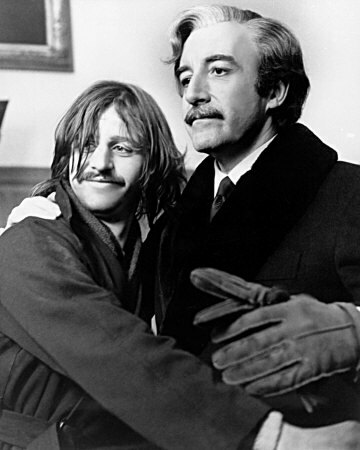 (9) Peter Sellers wanted the final 'vat of manure' scene to be recorded by the side of the Statue of Liberty. But they didn't. The financiers did not want to pay for the additional expense, even though they had the permission to do it. (10) Ringo Starr bought Peter Sellers' house in Brookfield off of him whilst making this film. He paid £70,000 for it, although Peter recently paid £50,000 for doing it up, and John Lennon offered him £150,000. (11) The following 'Python' scene was supposed to be in this movie -- entitled 'The Mouse Problem' -- but it was rejected by Peter Sellers. OK, so now that I have all of that off of my chest, I now know how should tackle this 'Magic Christian' review. I have to be like an archaeologist. Someone who can appreciate this film for what it is and not what its not. You see, it's not a conventional film with a normal conventional story-line. No way Jose. In many ways it's a mixture of movies like 'The Magical Mystery Tour', 'There's A Girl In My Soup', and 'Austin Powers' (click on links for the reviews), all rolled into one, with a rather sixties slanted message thrown in for good measure -- what would you do for money? Granted. It is a very valid message. And and does have a relevance in any day and age. In addition to this, this question does make you think about what you would do if you were in the situations that Guy and Youngman presents to their unsuspected victims with. However, it pains me to say that this 'message' does get kind of jumbled up within the scheme of things. And you can not help but just see it for what it should have been all along -- a sketch movie. Yep. This film should have been divided into chapters and displayed as such. As a whole, it is rather lop-sided to say the least -- with the two main protagonists going from place to place at a drop of a hat. But individual each scene plays out very well on its own merits -- having that very sixties vibe that I really do dig. For example: (1) My favorite scene in this film was the one between the two Goon's, Peter Sellers and Spike Milligan. You could tell straight away that the old magic was still there for them both, no doubt about it. (2) Although it wasn't the most dynamic part of this adventure, it was a blast to see Peter, Ringo, and John Cleese, all in the same frame together. (3) Yul Brynner, Christopher Lee, and Raquel Welch, were just brilliant in this film. The phrase 'small sharp shock' springs to mind when I think about them, ha! (4) The 'Badfinger' song, 'Come And Get It', has been playing around in my head since it first jumped out of the screen and into my ears. It sure is catchy. 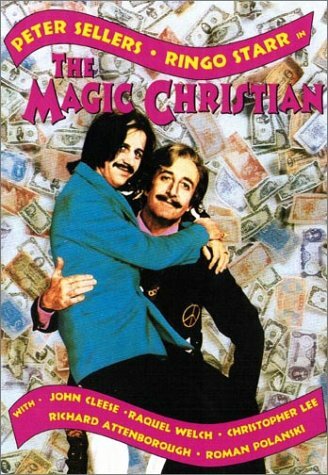 Overall 'The Magic Christian' is a film any British movie historian has to see at least once in their life. No plot. Sure. But it is well worth the watch for the actors concerned. Agreed, chaps? Ohhh! Class. The secrets of magic White magic love spells bring true love.